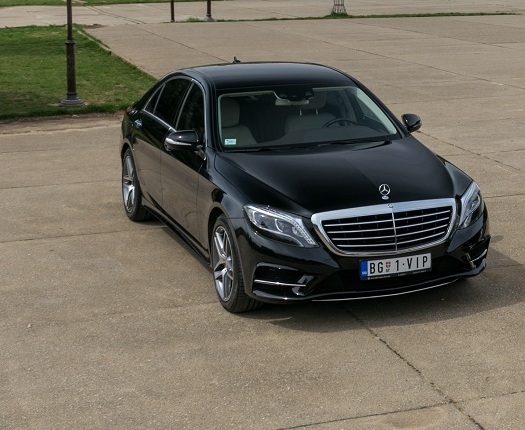 Chauffeur service with Mercedes S class long | Limo Service in Belgrade! 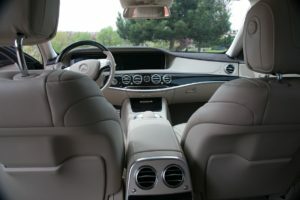 Chauffeur service in Belgrade with Mercedes S class long AMG from 345 euro! Every additional hour is 30 euro, every additional kilometer is 0,85 euro! This car is formerly known as Sonderklasse (German for "special class", abbreviated as "S-Klasse"), is a series of luxury flagship vehicles produced by the German automaker Mercedes-Benz, a division of German company Daimler AG. The S-Class designation for top-of-the-line Mercedes-Benz models was officially introduced in 1972 with the W116, and has remained in use ever since. Officially unveiled in May 2013, the newest S-Class has a more streamlined appearance than the outgoing model. Some interesting features include a large front grille inspired by the F700 Concept car and LED lights used exclusively inside and out - a first in the automotive industry. Two strong converging character lines give the flanks a more sculpted look, while integrated exhaust tips and a large glass roof (likely optional) highlight the design. 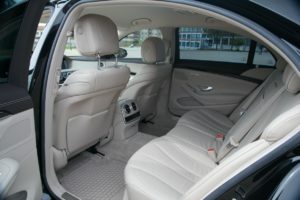 Along with the sedan, the S-Class spawned a coupe (Mercedes-Benz C217) and convertible (Mercedes-Benz A217) as well as an extended-wheelbase 'Pullman' variant, longer than the long wheelbase 'L.' While the short-wheelbase model carries chassis code W222, the long-wheelbase model uses chassis code V222. Unlike with previous generations, Mercedes focused primarily on the development of the longer model as many customers in the fast-growing Asian markets prefer to be chauffeured. Inside, almost every surface is covered by a 'luxury' material - everything that looks like leather is genuine leather and metal is used rather than any plastic alternative. The instrument cluster consists entirely of two widescreen (30.5 cm diagonal) LCD displays with animated graphics. A 'Head-Up' display and gesture responsive touch pad became options in early 2014. The W222 debuts the available Magic Body Control, consisting of windshield mounted stereo cameras that can 'read' the road ahead (Road Surface Scan) and communicate with the Active Body Control suspension to ready it for an uneven road surface. Initially only available on 8-cylinder models and above, Magic Ride Control attempts to isolate the car's body by predicting rather than reacting to broken pavement and speed humps. Available luxury appointments over and above what was offered in the W221 include a choice of massage type for each seat occupant (the W221 offered various intensities of a single massage type) and two levels of premium audio from luxury German brand, Burmester. The W222 has driver assistance systems aboard that allow it to steer a course within a lane and follow a leading vehicle for a short period (DISTRONIC PLUS with Steering Assist, also called traffic jam assistant). It will also slow or come to a dead stop and accelerate in response to traffic ahead. Mercedes engineers claim to have, under controlled conditions, ridden aboard a W222 S Class that has driven autonomously for 50 km, merely by altering parameters controlling equipment already fitted. Such modifications are not available to the general public.